Balloon Bombs: What are they? Balloon bombs were hydrogen fiiled, paper balloons with one 15 kilogram antipersonnel bomb and two or more incendiary devices attached. They were launched by Japan during World War II to wreak havoc on American cities, forests and farmlands. They were called the Fu-Go Weapon, supposedly a revenge bomb for the 1942 Doolittle raids on Tokyo. Only partially filled with air to compensate for different altitudes across the Pacific, they looked like giant jellyfish. The incendiary bombs were the biggest concern. During the dry season it could turn forest areas into an uncontrolled holocausts we have seen in recent years. The balloons were 32 feet in diameter, made of 600 separate pieces of laminated mulberry paper, stitched and pasted together and sealed with a potato paste. High school girls provided the major part of the work between October 1944 and February 1945. The balloons were partially filled with 60 pounds of hydrogen gas to allow expansion in the thin upper atmosphere where the Jet Steam carried them across the Pacific Ocean. Each balloon carried 32 sand bags as ballast to be released to regulate altitude differences between day and night-time temperatures. The last two ballast positions were taken by 26 pound termite incendiary bombs. The central weapon was a 33 pound high explosive bomb that fell with the balloon after the ballast was used up. 9,300 balloons were launched between November 1944 and April 1945. 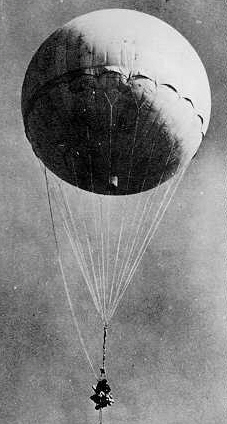 It's estimated that nearly 1,000 bomb bearing balloons reached North America. They were found in Alaska, Washington, Oregon, California, Arizona, Idaho, Montana, Utah, Wyoming, Colorado, Texas, Kansas, Nebraska, South Dakota, North Dakota, Michigan and Iowa, as well as Mexico and Canada. The last one was launched in April 1945. The last one found in North American was in Alaska in 1955 - its payload still lethal after 10 years of erosion. Picked up by a 74th Air Rescue Squadron H-5 helicopter crew from Ladd Air Force Base near Fairbanks, Alaska, it was sent to Wright-Patterson AFB, Ohio, for closer inspection. On May 5, 1945, a balloon bomb killed five children and a woman near Lakeview, Ore., when it exploded as they dragged it from the woods. Taking some local kids on an outing, Reverend Archi Mitchell watched in horror as his wife, Elsie, and the five children, ages 11 to 13, were killed. Those six were the only known victims of the balloon bombs. However, dangers of the balloon bomb still may exist. Hundreds were never found and may still be detonated with the slightest contact. The bombs actually caused little damage, but their potential for destruction and fires was awesome, not to mention their psychological effect on the American people. U.S. strategy was to not let Japan know of the balloon bombs' effectiveness. Cooperating for national security reasons, the press showed great restraint in not publishing balloon bomb incidents. As a result, the Japanese only learned of one bomb reaching Wyoming, landing and failing to explode, so they stopped the launches after less than six months. Source: "Japan's World War II Balloon Bomb Attacks on North America" by Robert C. Mikesh, Smithsonian Institution Press, 1973. In 1945, hundreds of African-Americans were part of the 555th battalion of trained paratroopers. ... The men were assigned to Operation Firefly, a secret stateside mission. 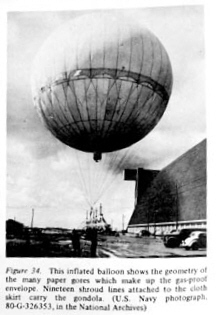 Unbeknownst to most Americans, the Japanese were using large balloons to float bombs and incedndiary device to the Pacific Northwest -- one of the few military attacks on the U.S. mainland during World War II. The 555th were deployed as "smoke jumpers" to disarm the explosives and extinguish or contain the fires. "We jumped in on 36 fires," the unit's First Sargent reported. "It was dangerous work." More than 400 men of the 555ths made over 1,200 individual jumps, suffering many injuries but only one death. Source: Parade, Sunday, February 23, 2014. About this page: Balloon.html - 9300 balloon bombs were sent against North American forests. Last updated Feb 23, 2014 -- add 555th.